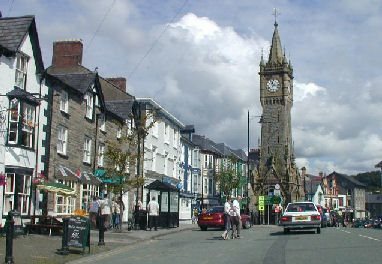 The attractive market town of Machynlleth lies in the Dyfi Valley , between the river's mountain source above Llanymawddwy and its estuary at Aberdyfi. The town claims to be the 'ancient capital of Wales' and has strong associatioins with the Welsh national hero Owain Glyndwr. At the end of the main street in the small market town of Machynlleth stands its curious and distinctive clock tower, which was built in 1872. It was erected by the people of Machynlleth to mark the coming of age of Charles Stewart Vane-Tempest, Viscount Castlereagh, the eldest son of the fifth Marquess of Londonderry of Plas Machynlleth. The foundation stone was laid on 15 July 1874. The town has a population of just over 2,000 and offers the visitor a wide range of accommodation, restaurants, cafes and pubs. Its independent shops provide a refreshing change from the retail chain stores. The Royal House, possibly dates to the fourteenth century and is so named as Charles II is reputed to have stayed there in 1643, is situated where Garsiwn Lane joins Penrallt Street, it now houses a tourist information desk. The town's main street, Maengwyn Street, is the venue for Machynlleth's famous Wednesday Markets. 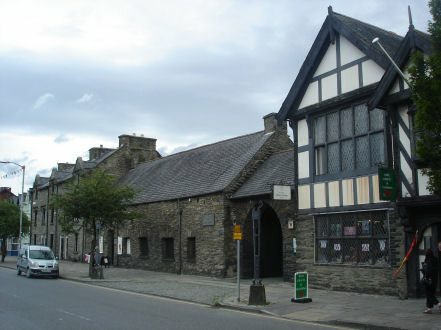 The town was granted its charter in 1291 by King Edward I.
Plas Machynlleth, set among parkland, was once the residence of the aristocratic Vane-Tempest family. The front elevation of the house dates to 1853 and encases an earlier building. St. Peter's Church dates from the medieval period and boasts an attractive with rood screen and carved stalls. The church was rebuilt in 1827. The Tabernacle Arts Centre, a neo-classical Methodist chapel, together with adjacent buildings forms a cultural centre - The Tabernacle, which houses the Museum of Modern Art Wales, containing a permanent art collection and hosts a series of exhibitions. The Glyndwr Chapel Royal of St Peter ad Vincula, which is well worth a visit, is located at the nearby village of Pennal, near the River Dovey estuary. Called "perhaps the most unique small church in Wales" the chapel was the site of Owain Glyndwr's last parliament in 1406. The chapel contains the Pennal Green Man stained glass window, dating from 1871, it is the only stained-glass Green Man in Wales. Recent additions include an attractive commemorative garden in the style of a Mediaeval Monastic Herb Garden. Guided tours are available. To visit the chapel's interesting website please see our links page. The town is home to the Owain Glyndwr Institute and the Parliament House which stand in Maengwyn Street. The Parliament House occupies the site where in 1404, Glyndwr, Prince of Wales, in revolt against Henry IV of England, is reputed to have held the first Welsh Parliament. The present building dates to the sixteenth century and once served as a townhouse. 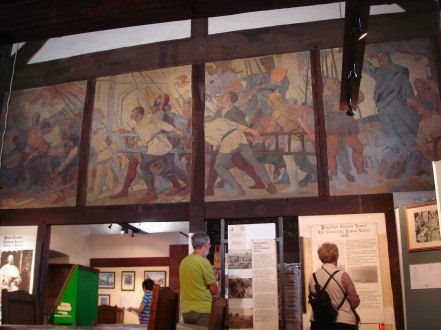 Interesting exhibitions and displays cover Glyndwr's life and provide information on his military campaigns against the English. The adjoining timber framed building was built as the Owain Glyndwr Institute in 1911 by Lord Davies of Llandinam. Opening times:- Easter - Sept, Mon - Sat, 10.00am -5.00pm and at other times by arrangement. 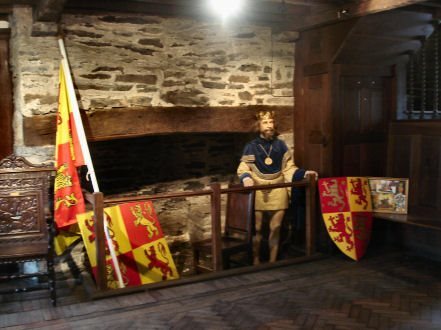 Owain Glyndwr (1349- 1416), was a figurehead of Welsh nationalism leading a rebellion against the occupying English forces of Henry IV in the fourteenth century. Declaring himself Prince of Wales, and a man of charisma and great ability, by June 1402, Glyndwr had recaptured and controlled most of Wales. He called a parliament at Machynlleth which drew up mutual recognition treaties with France and Spain and was crowed king of an independent Wales.